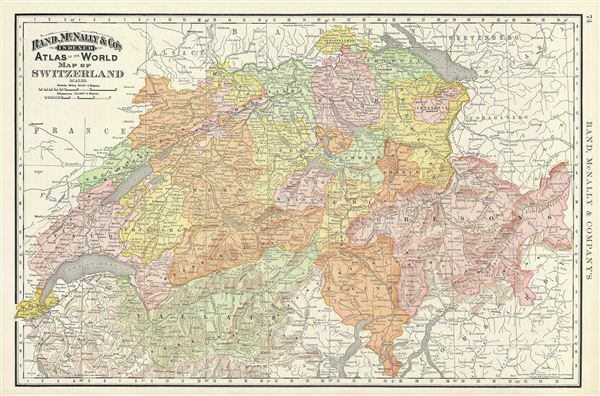 This is a beautiful example of Rand McNally and Company's 1892 map of Switzerland. It covers the entirety of Switzerland or the Helvetic Republic divided into its constituent Cantons from Vaud to Grisons. After the creation of a federal constitution in 1848, Switzerland underwent a period of rapid social and economic development. The cantonal currencies were replaced by a single currency (the Swiss Franc) and many of the cantons subsequently established representative governments and instituted freedom of the press and trade. A year before this map was created; the Swiss constitution was revised to use the unique system of direct democracy. Color coded according to cantons, the map notes several towns, cities, rivers and various other topographical details with relief shown by hachure. This map was issued as plate no. 74 in the 1895 issue of Rand McNally and Company's Indexed Atlas of the World - possibly the finest atlas Rand McNally ever issued. Rumsey 3565.018 (1897 edition). Philip (atlases) 1026 (1898 edition).